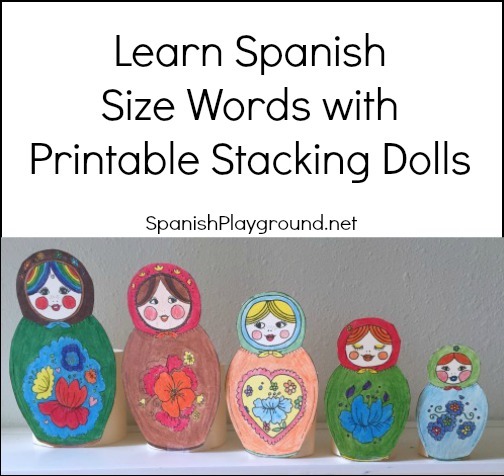 Printable stacking dolls are a fun and easy way to practice Spanish size words and other vocabulary with early learners. Preschoolers are particularly taken with the idea they can fit inside each other. They are fun for older children too, especially kids who enjoy cutting and coloring crafts. Traditional Russian Matryoshka dolls are made of wood. I have several sets that my university students from Russia gave me when I was teaching ESL. I show these to my Spanish students too, so they know what their paper dolls are based on. There are several sets of printable stacking dolls online and they all work for Spanish size words. The ones in the photo are from Activity Village. They are the ones I use. Making Learning Fun also has a set, and I am sure there are others. I use the dolls with preschoolers to teach Spanish size words, comparisons and practice other vocabulary. The dolls work well for learning Spanish size words and comparing size: Esta muñeca es más grande que esta. Esta muñeca es más pequeña que esta. I use them for la más grande de todas / la más pequeña de todas. Kids understand this structure immediately, but it is a good way to reinforce Spanish size words.I show the kids the largest and the smallest dolls. I emphasize that the biggest is bigger than all the others by comparing it with each: Es más grande que esta y también más grande que esta. Es la más grande de todas. I do the same with the smallest. Then I ask them to show me la más grande y la más pequeña. Ordering by size is another a way to introduce la más grande. I ask ¿Cuál es la más grande? and when kids answer, take that doll out and put her at the head of a line. Then I ask again about the dolls that are left, ¿Y ahora, cuál es la más grande? I use the dolls to review the question ¿cuántas?. It is fun to start with 5, and then stack one inside and ask again ¿Cuántas muñecas hay? You can use the dolls to practice alta, baja, mayor, menor. The dolls are great for working with family vocabulary. Assign different generations – la abuela, la mamá, y tres hijas. Give the dolls names to make the comparisons easier and is to review llamarse: Esta muñeca se llama Sofía. Y está como se llama?